Decorating a tree with edible ornaments is a great way to share the holiday spirit with the birds, and there is a wide range of foods you can offer on a bird Christmas tree that will be welcomed by winter birds. The more you decorate a tree to feed the birds, the more species you will attract, and the more birds you'll be able to enjoy during the winter. Birds are not picky and the tree you decorate as a Christmas feeder does not need to have a perfect shape. Ideally, the tree will have plenty of horizontal branches widely spaced enough that seed ornaments and other decorative foods can hang freely and give many birds room to feed. An evergreen tree will offer additional shelter and keep edible ornaments more protected from snow, but it may have less space for birds to perch while feeding or to access feeders. If you are decorating a tree so you can enjoy the birds that visit, choose a tree or shrub that is easily visible from a comfortable window. It is best if there are feeders in or near the tree already, which will help birds find it more quickly to enjoy their holiday treats. Choosing a tree where birds regularly perch or roost is another good option to be sure they notice the delicious decorations. If you don't have a suitable tree available, consider a large upright branch, potted evergreen tree, or even a thrift store artificial tree instead. When choosing foods for a bird Christmas tree, keep in mind the feeding preferences of your backyard birds. Southern habitats may have more fruit-eating birds that stay the winter, making strings of fruit an appropriate choice, while nuts and suet are more suitable for colder areas. 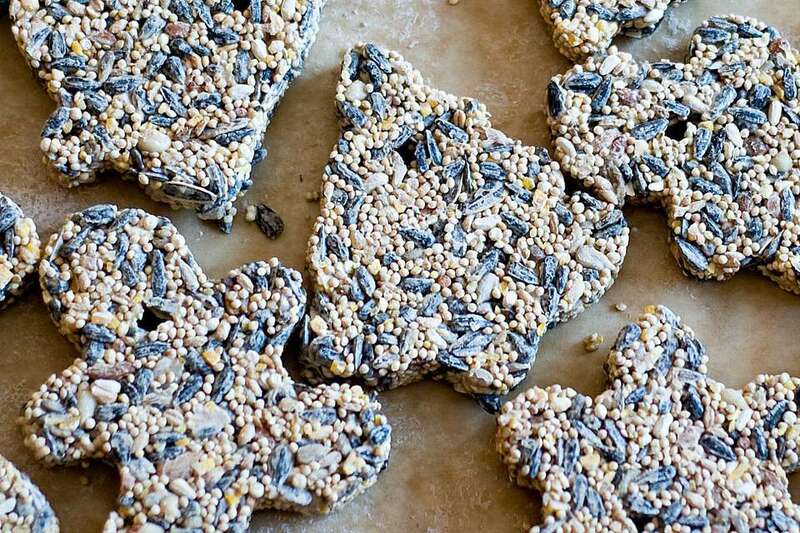 Also, while popcorn, donuts, and other kitchen scraps can be a treat for the birds, avoid using them exclusively and offer a greater variety of more nutritious seed or suet options instead. To hang ornaments, use small lengths of string or natural twine to make loops or bows for each ornament. Red and green hangers or holiday-themed ribbons are popular for bird Christmas trees and add a festive pop of color. The birds may use the string to help insulate a roosting area, or they may collect it for nesting material in the spring. Avoid very thin threads or fishing line, however, which could become a tangle hazard for visiting birds. It might take a few days for birds to discover a feeder tree, but once they do, they will happily make use of it long past the holiday if you keep the tree and its treats available to them. Decorate the tree early to give birds plenty of time to find the food before the weather is at its harshest. It can take a week or two for birds to become familiar with the tree and comfortable nibbling at its treats. Make extra ornaments and replace them as needed all winter long to provide an attractive and effective feeder for many birds. More treats give more birds places to feed and ensures a good food supply for all visiting birds to eat. Make your yard even more bird-friendly by offering a heated bird bath to give the birds liquid water and winter bird shelters to help small birds stay comfortable in the coldest weather. Remember that other wildlife may also visit the tree for a meal, such as deer, raccoons, squirrels, and other animals. Share the spirit of the season with all visitors and position some food so they can all reach a nutritious snack. Decorating a Christmas tree for the birds and other wildlife can be a fun, enjoyable activity for families, school groups, churches, birding groups, and other organizations, and it is a great way to feed winter birds. Want another quick project to decorate winter trees? Try a bird feeder garland!